On 3rd July 2012, the members of Young Biologists' Association went on another field trip which was organized as the 3rd trip for this year. All the members gathered in front of the Nugegoda Pizza hut at about 6.30 am. There were 19 members and another was to join us on our way. Therefore we hired two vans for the trip. We started the journey from Highlevel junction, Nugegoda at about 7.00 am. 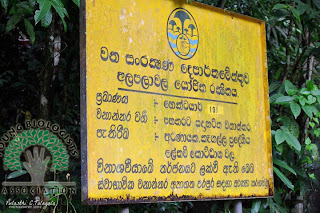 We followed the route Nugegoda, Kaduwela, Malambe, Balummahara, Pasyala and reached Kegalle. On the way to Kegalle we stopped at the "Jinadasa Thalaguli" to have breakfast. By 10.00 am we were at our destination, the famous "Kurulu Kale". We found an existing trail into the forest and decided to follow it. It started close to the Thapo Wanaya temple. At the entrance to the forest a small briefing about the forest and how to behave inside the forest was given to the team by Amila Sumanapala. Then the team started trekking following the foot path. As we trek we encountered many animals and plants. Wal Del (Artocarpus nobilis) was prominant among the vegetation and trees like Milla (Vitex pinnata) were also common. A few birds also seen though many were heard. 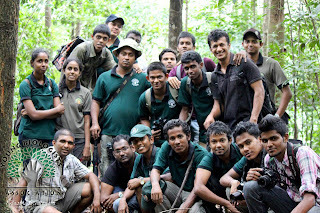 Among the bird species observed visually or vocally Tickell's Blue Flycatcher (Cyornis tickelliae), Crested Serpent Eagle (Spilornis cheela), Hill Myna (Gracula religiosa)and Sri Lanka Hanging Parrot (Loriculus beryllinus) were common. A troop of Toque macaque were observed on the trees along the trail. It cosisted of around 15 individuals. The butterfly Glad-eye Bushbrown (Nissanga patnia)was common inside the forest while Blue Mormon (Papilio polymnestor), Ceylon Birdwing (Troides darsius) Tailed Jay (Graphium agamemnon) were also observed. While searching for animals everywhere including among leaf litter, on tree trunks, inside tree holes and under rocks and fallen logs we could find many animals belonging to several taxa. The land snail Acavus phoenix was commonly found on tree trunks while land snails including Theobaldius spp., Euplecta spp. were found among litter. An individual of Polypedatus cruciger (Hourglass Treefrog) was found inside a tree hole partially filled with water. The Kangaroo lizard (Otocryptis wiegmanni) and Whistling Lizard (Calotes liolepis) were also observed in the forest. We left Kurulu Kale at about 12 noon and went searching for the Alapalawala Proposed Forest Reserve. To reach there we followed Bulathkohupitiya-Karawanella road until We reach Hettimulla junction. Then after travelling a few kilo meters along the Hettipola-Gewilipitiya road we came to Alapalawala. It was around 1 p.m. when we reach there. After having a light meal of bread and seeni sambol we headed in to the forest. Our hike started along a small stream. The dragonfly Shinning Gossermerwing (Euphaea splendes) were observed perching on rocks and over hanging branches along the stream. We found a Kangarro lizard and a strange looking insect on the stream bed. 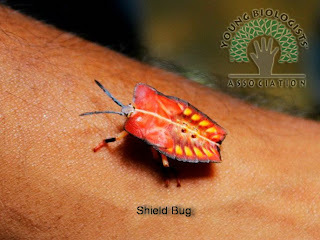 The insect emitted a strong smell and secreted a chemical which made the handler's fingers yellowish orange. There was a pair of them. The one shown here had more brighter colours while the other one was mainly light brown in colour. These insects were later identified to be a Shield bug species of Family Pentatomoidae. After walking about 50 m from the starting point we turned right and entered the forest. Forest floor was a bit slippery due to wet soil and litter. It was a secondary rain forest with a high canopy and less under story vegetation. Among the faunal species observed, Green Pit Viper and Tree Climbing Crab were among some highlights. 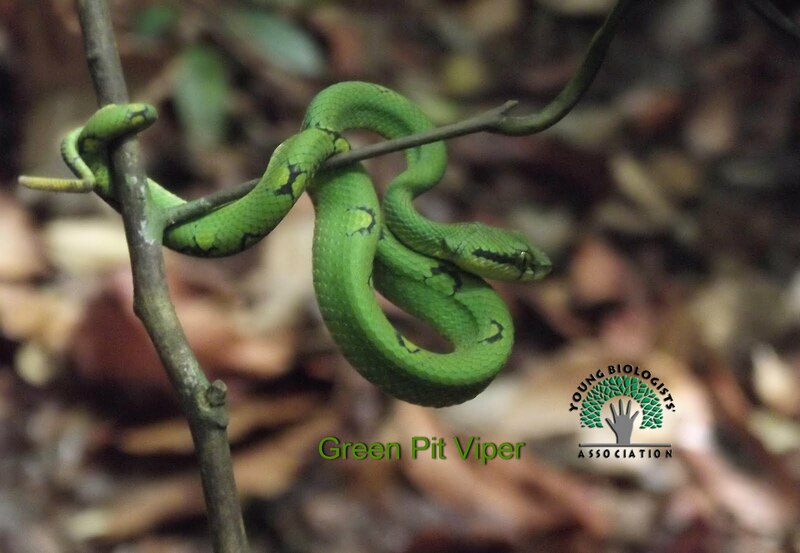 A juvenile Green Pit Viper (Trimerusurus trigonocephalus) was observed on the leaf litter next to the foot path. It was a beautiful snake with light green body and some black markings towards the rear end. Green pit Viper is one of the endemics in the country and a mildly poisonous snake. The tree crab Perbrinckia scansor was found inside a tree hole filled with water. The depth of the hole was about 4 cm and the crab was first observed just below the water surface. Later we took it out and examined closely. 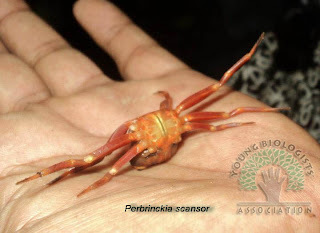 Perbrinckia scansor is the only known tree climbing crab in Sri Lanka. 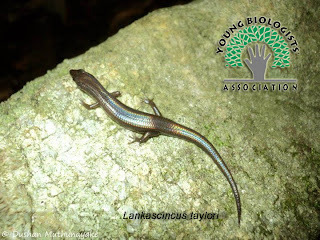 It's an endemic species which was first described from Sinharaja World Heritage site in 1995 under the genus Ceylonthelphusa. Although its considered as a rare species it's not categorized as a threatened species in the 2007 Redlist of threatened fauna and flora in Sri Lanka. Thus it's considered to be a Least concerned species. Apart from them several other interesting fauna species were also encountered during the time spent in the forest. 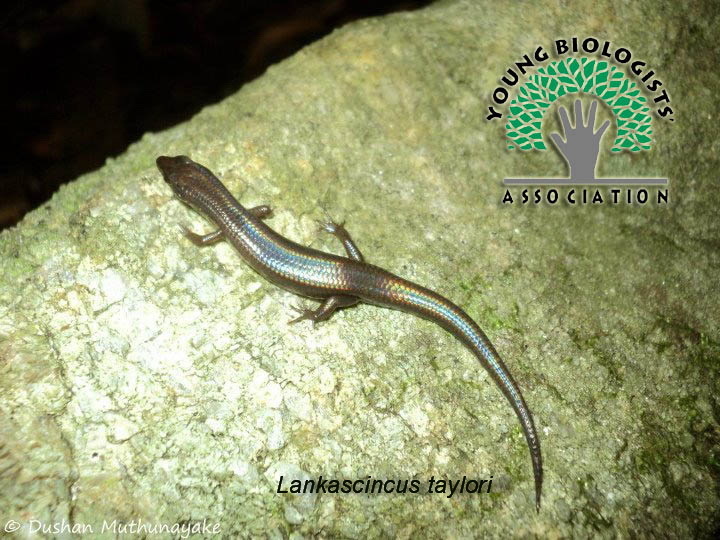 Two of such reptiles were Lankascincus taylori (Taylor's Lankaskink)and Lyriocephalus scutatus (Hump-nosed Lizard). They both are endemics. Among the birds observed Asian Black Bulbul (Hypsipetes leucocephalus), Sri Lanka Emerald-collared Parakeet (Psittacula calthropae) , Sri Lanka Hanging Parrot (Loriculus beryllinus), Scarlet Minivet (Pericrocotus flammeus), Hill Myna (Gracula religiosa) and Emerald Dove (Chalcophaps indica) were common. Common Plam Squirrel (Funambulus palmarum) Giant Squirrel (Ratufa macroura) and Toque Macaque (Macaca sinica) were the only mammals seen. The land snail fauna observed consisted of Acavus phoenix, Oligospyra polei, Glessula pallens and Euplecta spp.